So Greg Munson, the co-founder of BattleBots called us and let us know we didn’t make it. 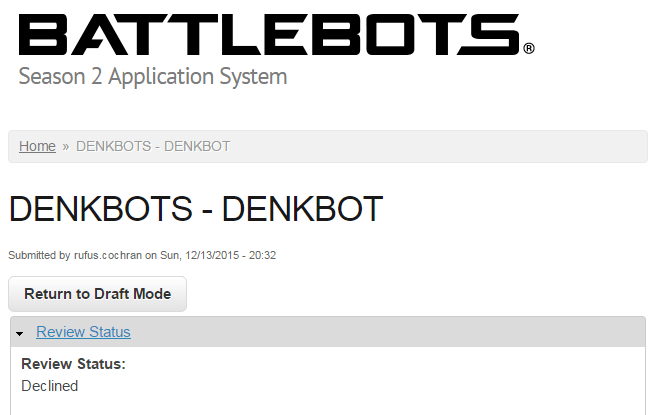 First off, everyone here at denkbots would just like to say thank you to Greg and everyone at BattleBots for even offering the opportunity to apply for such an iconic event and for affording a League of Extraordinary Nobodies from Indiana the chance to just be considered. To be called by Greg, even in rejection, was an honor we are all thankful for. He let us know that we had an amazing team (brand, composition, skills, etc.) and we are what the show is looking for. He also let us know that we designed a solid, destructive robot; But that it was a square, and for the sport to survive on television the day of the square bot is a thing of the past. We want to take a moment to thank all of our team members; Nick for the amazing video, Sunset Pig for the mind blowing music, Doti and Sperellis for the phenomenal brand, Butters for the clutch web hosting, Patrick for the triple all-nighter CAD work, Kavitha for the last minute electrical schematics, Colin and Andrew for the fantastic strategy talks, Matt for the always insightful and humbling design discussions, Alex for the on-point brevity and humor, Lewis for the classic footage and yet to be used welding skills, and Rachel for putting up with Rufus through all of this. We came together and accomplished more than we could have ever hoped for and the experience was in every way exceptional. Finally, the last thing we want to pledge to our friends and followers: This journey isn’t over, in the short term, the long term, or in any way shape or form. We have created more than an application for a TV show, we created a brand, we built a small but dedicated fan-base, and most importantly we built a team. We weren’t told we couldn’t build a robot, or that we couldn’t be a team: We got an invitation to tread a new path, the path of our robot forefathers who didn’t build robots for TV, they built them because they loved doing it… and because we are too stubborn and stupid to do anything else, that is exactly what we are going to do; Build an awesome robot, because we love doing it. We just had the prologue to our story written and from that story we will Learn. And that story will Inspire. If you have enjoyed the articles we have written so far and would like to follow along with our Season 2 reveal, Season 3 redesign/build, and future content please like on Facebook; follow on Twitter, Instagram, Flickr, and Google+; subscribe on YouTube; and fumble on Tumblr! Also, if you have Learned from any of the content we have Created, please share with your friends so we can Inspire more people together! Feel free to leave a comment below and let us know what content you would like to see in the coming months!